Should you be using A/B Testing? 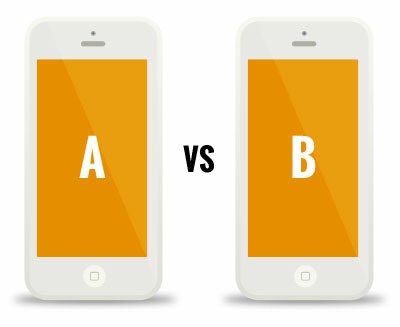 By Canvas Digital Digital Comments Off on Should you be using A/B Testing? When designing websites it’s all too easy to get bogged down producing seemingly well-written content, and beautiful design that we feel works best… but is it really working? Should we be doing more to find out what actually works and what the user likes? There are many different ways of testing if your users are reacting positively to your design, and in today’s fast moving market we should use what tools are available to us to find out what actually works and delivers results. One way of doing this is by using a technique called A/B testing. A/B testing (sometimes called Split Testing) is a method of comparing two versions of a web page (or content within that web page) against each other to work out and determine which version performs better and produces greater results. A/B testing is a way of taking your web page and creating two versions for your audience to see. Once you have worked out what you would like to test, you would have your original version of the webpage (A) and then create an alternative/modified version (B), where you would change a heading, an image, colours, positions of elements, etc. Then half of your traffic to your page would be shown the original version and the other half of your traffic would be shown the modified version of the page. The user engagement for each version would then be measured and that data is collected into an analytics dashboard, giving you all the results as to how they performed. You can then determine whether changing the experience had a positive, negative, or no effect on the visitor’s behaviour. You don’t even need to stop here, as these results could give you more ideas to run further tests and modifications to how your page performs. Whatever the outcome of your testing, this should provide you with a lot of useful insight into the user’s engagement with your site or page. If you would like to find out more about how A/B testing could help your website performance and give you greater results, give us a call.